Crop circles are organized harmonic forms that manifest around the world, the result of an energy interacting with the physical world – in this case plants. This energy is comprised of light, sound and magnetism. To date, crop circles have been reported in 29 countries, and have appeared in mediums such as wheat, barley, canola, trees, ice, rice paddies, even linseed. Only around 1980 was serious attention finally given to the phenomenon, primarily in southern England, where 90% of designs are reported. The designs appeared primarily as simple circles, circles with rings, and variations on the Celtic cross. By the late 1980s they had developed straight lines, creating pictograms not unlike the petroglyphs found at sacred sites thoughout the world. After 1990 the designs developed exponentially in complexity, and today it is not unusual to come across crop glyphs mimicking computer fractals and elements expressing fourth dimensional processes in quantum physics. If you happen to buy the media-fed misrepresentation that all crop circles were originated by two sexagenarians called Doug and Dave, you are not in the minority. Once in a while, governments like to control public interest in unexplained phenomena they cannot control by ‘debunking’ – a technique developed by the US government after WWII for the sad purpose of controlling mass opinion (as stated in the 1953 Robertson Panel, details of which are obtained under the US Freedom of Information Act). This method is very effective because it makes use of two extraordinarily simple tools of mass control – ridicule and fear. But only if you are prepared to believe everything you are told on television and newspapers, particularly when TV programmes suppress scientific or factual data with which the public can form an educated opinion on the subject. This absence of evidence is then replaced by ridiculing the subject through association with other ‘fringe’ topics; so-called ‘experts’ are brought-in to explain away all events as tricks of the imagination – freak weather conditions, drunk students, even sexually excited animals! When they claimed making all the formations around the English county of Hampshire, for example, it was pointed out that the majority of known formations had actually occured in another county – “Er, no, we didn’t do those either,” they replied. In the end, not even Doug and Dave knew which ones they had made. And although they claim to have made hoaxes since 1978 – at the time the published date of the first design – unpublished evidence revealed how crop circles had been manifesting since the 1890s. The public has never heard D&D’s retractions, nor been given the opportunity to compare the mess created by D&D with the mathematical elegance and anomalies of the real phenomenon. In 1998, however, the surviving member of the deceptive duo did make an incredible admission to British newspapers that he’d been “guided by an unknown force”. Prior to 1989 the hoaxing problem was virtually unheard of. Yet since Doug and Dave’s inauguration, many copycat hoaxers have appeared on the scene. That people with a good amount of training can go into a field and eventually create a coherent pattern has never been the issue in crop circels research – in 1998 a group of hoaxers called Team Satan/circlemakers was paid to go to conveniently out-of-the-way New Zealand to make an elaborate formation for The Discovery Channel. The deceptive tactics used to trick a viewing public into accepting that crop circles are human made are dealt with here. In genuine formations the stems are not broken but bent (right), normally about an inch off the ground and near the plant’s first node. In special cases, the stems are bent six inches from the top of the seed head. Such features defeat the hoax argument, since a plank or garden roller is required to flatten the crop to the ground, resulting in clear damage to the plants. The plants appear to be subjected to a short and intense burst of heat which softens the stems to drop just above the ground at 90º, where they reharden into their new and very permanent position without damage. Plant biologists are baffled by this feature, and it is the singlemost method of identifying the real phenomenon. Research and laboratory tests suggest that infrasound (sound below 20 Hz) is capable of producing such an effect: High-pressure infrasound is capable of boiling water inside the stems in one nanosecond, expanding the water, and leaving tiny blowholes in the plants’ nodes. The pressure applied also causes the water to steam, and it is reported by farmers that when they stumble upon a new crop circle they see steam rising from within the design. This process creates surface charring along the stems. The tremendous application of local heat is also responsible for altering the local water table, as millions of gallons of surface and sub-surface water is evaporated. With the heat and electro-magnetic frequencies applied, it has been scientifically documented that soil samples taken from within crop circles show changes to its crystalline structure and mineral composition. Expert analysis concludes that such a process requires temperatures of 1500º C and sub-soil pressure typically found in strata thousands of years old. Evidence even exists of four non-naturally occuring, short-life radioactive isotopes in the soil inside genuine crop circles (these dissipate after three or four hours, causing no adverse side effects); in fact, the soil in and around them appears to have been baked. Hardly the kind of anomalies created by pranksters with planks! Crop circles also show existence of ultrasound –sound above the human hearing range – and such frequencies are known to exist at ancient sites such as stone circles, long barrows, tumuli, dolmens and menhirs. And like all sacred sites, temples and places of worship – such as Gothic cathedrals – the crop circles appear at the intersecting points of the Earth’s magnetic pathways of energy; thus the size and shape of a crop circle is typically determined by the area of these ‘node’ points at the time of their appearance. This electric and magnetic energy can interact with brainwave patterns, and because the human body is itself electro-magnetic, crop circles are known to affect people’s biophysical rhythms. Consequently, it is not unusual for people to experience heightened states of awareness and healings in crop circles – a situation also common to sacred sites and holy spaces. People may also experience dizziness, disorientation and nausea. All these effects can be caused by prolonged exposure to both infrasound or microwaves, which also interact with the water in the body. Biophysical evidence shows the plants’ nodes (its knuckles) are drastically extended (right); also observed are distortions of seed embryos, and the creation of expulsion cavities in the plants as if they have been heated from the inside. In genuine formations there is also a reorganization of the plant’s crystalline structure – in these microscope photos (below right) the top image of a control sample of wheat radically differs to the one below taken from a crop circle. Other evidence from crop circles shows how the floors of laid plants are swirled in mathematical proportions relative to the Golden Mean, the fundamental vortex used by nature to create organisms such as shells, sunflowers, galaxies, even the spatial relationship of the bones in the human hand; the floor of crop circles can have up to five layers of weaving, all in counterflow to each other, with every seed head intact and placed beside each other as if arranged in a museum case. Genuine crop circles are not perfectly round but slightly elliptical (a hoax, requiring a fixed central rope, cannot achieve this adequately). Their edges are crisply defined from the flattened crop as if drawn with a compass, and incised with surgical precision. Hoaxes, by comparison, bear a stylistic resemblance to tuffs of greasy, uncombed hair – and, of course, all their plants have been trampled, bruised and crushed. Crop circles are sometimes accompanied by trilling sounds, since captured on tape and analysed by NASA as being artificial in origin, and bearing a harmonic frequency of 5.2 kHz. Crop circles alter the local electromagnetic field; often compasses cannot locate north, and cameras and cellular phones malfunction. Whole packs of fresh batteries are drained in minutes, and the frequecnies involved have been known to affect helicopter and aircraft equipment. Radio frequencies are markedly different inside their space; local farm animals avoid the crop circles or simply act agitated hours before one materializes; and car batteries in entire villages fail to operate the morning after one is found nearby. In some major events, entire towns have been left without power. Since genuine crop circles materialize at crossing points along the Earth’s magnetic energy currents, they are influencing the energy patterns of local phehistoric sites, which were built upon identical principles. They reference local Neolithic sites in size/shape/direction, and are dowsable upon entry, with as many as 150 concentric rings of energy radiating beyond their physical perimeter, like ripples in a pond. In fact, a year after they have been harvested and the field ploughed and re-sown, the energy imprint of the formations will still be dowsed, long after their physical traces have vanished. At Stonehenge in 1996 (below), a pilot reported seeing nothing unusual while flying above the monument at 4:15pm, yet 15 minutes later a second pilot reported this huge 900 ft formation resembling the Julia Set computer fractal. Comprising 149 circles and aligned along a spiral curve, it lay within view of the well-patrolled monument. It took a team of 11– including myself – no less than five hours just to survey the formation. Still not convinced that a genuine phenomenon is at work around the world? This web site contains a sampling of the on-going research dedicated to enlightening the public. 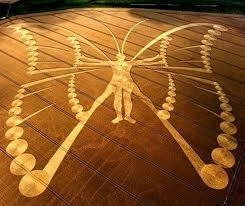 Look at the pictures, study the research or better still, visit a genuine crop circle or read my comprehensive book. You’ll get the message pretty quickly.